Welcome to Stella Maris, a family exceptional villa located on the central beach, belonging to the waterfront classified Hossegor. This 30's villa is ideal to accommodate three couples with children with 5 bedrooms: 3 double bedrooms and two bedrooms with 3 single beds. The spaces are designed to live together without stepping on it! - Ocean Terrace 30m2 with table and chairs outside, 3 chairs. Ability to add a hammock. Direct access to the beach from the terrace. - "Royal" Room: large double bedroom with bathroom with tub and toilet. TV built into the room. - "Blue" Room: bedroom with double bed (160) and TV. - "The Studio" room three single beds (90x200) with shower, toilet and integrated kitchenette. Direct access to the promenade overlooking the beach. 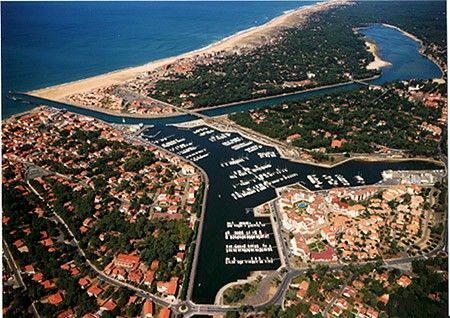 - For children, the beaches of Hossegor offer beaches without waves and with many activities such as sailing and water skiing. - For most players, the casino of Hossegor is 400m. - The old fishing port of Capbreton brings the sins of the day in the morning between 9am and 11am and afternoon between 15h and 18h. We can provide you the contact of a baby sitteuse if necessary. N. B: The Villa is divided into two apartments, the rental portion includes ground beach, ground floor and first floor bedroom. Landlord: "This house is in my family for 4 generations. She was able to offer me the perfect setting to provide unforgettable memories to my children and grandchildren. Beware though, take a drink with friends and family with the sunset on the terrace until the barbecue is ready is a routine which we quickly get! Maison spacieuse, propre et très bien équipée avec un emplacement privilégié. Parents et enfants avons passé des vacances formidables et nous reviendrons ! De plus, propriétaire est charmant et compréhensif, toujours prêt en cas de problème. Villa soignée et fonctionnelle avec un emplacement idéal sur le front de mer d'Hossegor, très appréciable pour profiter de la mer, du surf et de la centrale. Propriétaire sympathique et disponible en cas de problème (logement au dessus). Idéal pour une famille ou même deux! The uniqueness is due to the location on the dune to the ocean. The villa is part of an architectural ensemble classified. No road to cross to go to the beach of fine sand immense and free. 'The beach is my garden' is often said, one can watch the kids from the terrace. 'It's like a boat' when looking at the sunset on the silver sea! For those who like to swim in a calmer water than the ocean, the marine lake and the canal that connects the ocean are a 15-minute walk (500 meters). Small children will find safe beaches. Hossegor is a popular spot for surfers, beginners will find near schools.